A big week with big money. Let's get crackin'. 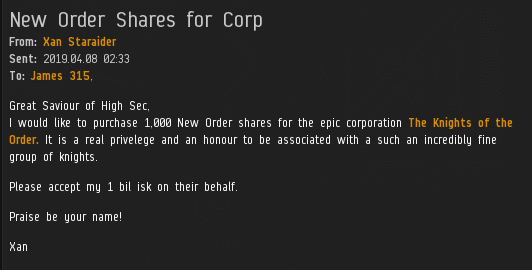 Nakapai doubled his holdings with a purchase of 1,315 additional shares, taking us past the 1,752 billion isk mark and earning him a Supreme Protector's Tip of the Hat™. And that's just the start. 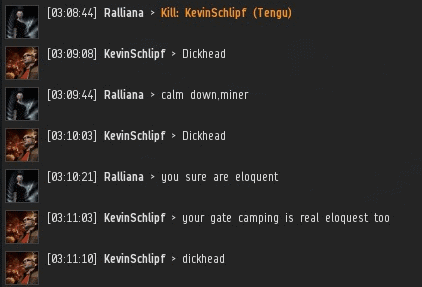 The Lawton School for Pubbies Who Can't Mine Good has always supported the highsec community, and they continue to do so. With a purchase of 5,000 additional shares, the School has helped us achieve the 1,753, 1,754, 1,755, 1,756, and 1,757 billion isk marks. In so doing, the School has earned another Quintuple Supreme Protector's Tip of the Hat™. This was a very significant move, by the way. The purchase vaulted the tLSfPWCMG past a couple of very high-ranking shareholders. With a total of 38,315 shares to their name, the School is now ranked in seventh place on the all-time shareholders list. Yes, there's still more. Apo123 purchased 200 additional shares. We've reached the 1,758 billion isk mark; a Supreme Protector's Tip of the Hat™ goes to Apo123 for a well-timed purchase. Although the Lawton School is still by far the biggest of the corporate shareholders, it's always nice to see more corps getting in on the action. The Knights of the Order corporation has joined the list with its purchase of 1,000 shares. That brings us to the 1,759 billion isk mark. tKotO now have a Supreme Protector's Tip of the Hat™ to their name. Last, but certainly not least: Lord Mandelor made a huge upgrade to his holdings with a purchase of a block of 10,000 shares. You know what that means: a Decuple Supreme Protector's Tip of the Hat™! Now to rattle off the milestones: Lord Mandelor has brought us to the 1,760, 1,761, 1,762, 1,763, 1,764, 1,765, 1,766, 1767, 1,768, and 1,769 billion isk marks. Well done, all. Two trillion isk is looking a lot closer than it did only a few weeks ago. Anti-Gankers shudder at the prospect. It should come as no surprise that the anti-Code rebels and assorted bot-aspirants do not approve of our Agents and their gate camps. Curiously, these same anti-Code types claim that we don't really "control" highsec. They tell us to go to nullsec if we want to control space. And yet... What's the principle means by which players control nullsec systems--particularly in the NPC sovereignty areas? ...Why, by camping gates, of course. Go figure. Ralliana still gets some good feedback.